Grant Thy faithful rest, we pray. Christ Enthroned or Christ in Majesty or Christ in Glory (Latin: Maiestas Domini) is the Christian image of Christ seated on a throne as ruler of the world, always seen frontally in the center of the composition, and often flanked by other sacred figures, whose membership changes over time and according to the context. The image develops from Early Christian art, which directly borrowed the formula of depictions of the enthroned Roman Emperor. 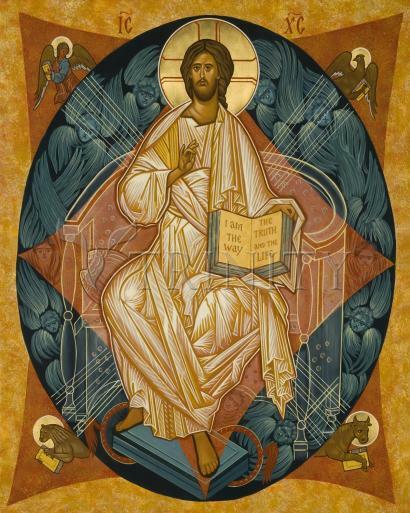 In the Byzantine world, the image developed slightly differently into the half-length Christ Pantocrator, "Christ, Ruler of All", a usually unaccompanied figure, and the Deesis, where a full-length enthroned Christ is entreated by Mary and St. John the Baptist, and often other figures. In the West, the evolving composition remains very consistent within each period until the Renaissance, and then remains important until the end of the Baroque, in which the image is ordinarily transported to the sky.